The Grasshopper buzzard or Savanna buzzard (Butastur rufipennis Sundevall, 1851) as is often called in Africa, belongs to the order of the Accipitriformes and to the family of the Accipitridae. When Sundevall, the famous Swedish ornithologist who did classify this bird, had the opportunity of controlling the collection of the most famous African ornithologist of that time, Johan August Wahlberg, noticed that this bird did show some particular structural characteristics that grouped peculiarities found in some Palearctic birds. And in fact he applied the scientific term of Butastur rightly to indicate, as the Greek ethymology, the “Buteo” = buzzard and “Astur” = goshawk and rufipennis due to the characteristic reddish colouration of the wing coverts. There have been many interpretations about this assignment, with the insistence of some who wanted to place it into the genus Buteo, others in the genus Kaupifalco, others in the genus Accipiter but eventually the historical classification has been confirmed. Still today, the European vernacular names, coming certainly from the scientific denomination seen that this bird has never been sighted in our continent, emphasize its behavioural characteristics, proposing again Sundevall’s dilemma concerning the real morphology of this bird. In English, Grasshopper Buzzard, Buzzard-Eagle, Buzzard-Hawk; in French Busard, Busautour des sauterelles; in German Heuschreckenteesa; in Spanish -Azor or Busardo langostero; in Italian Poiana delle cavallette or Poiana della savana and in Swahili Shakivale bawa-jekundu. This goshawk-buzzard occupies a vast part of the African territory extending in the sub-Saharan belt from the Atlantic coast to Sudan and southwards, up to Tanzania being totally absent in the central, southern and southwestern part of the continent. The southern limit is rightly reached in the Tanzanian savannas. It is much more common in the western part of the continent whilst its presence becomes more rarified when proceeding east. Partially migrant wit movements linked to the rain seasons, rightly when the grasshoppers, one of its main foods, do abound, it usually moves with a north-south movement always keeping inside the previously described belt. It is a bird fairly careful in avoiding the dangers of the heavy rains, which it appears not to bear, but extremely rapid in taking advantage from the moment when the nature begins to revive. Though not present in great number, it is however very diffused and is not considered as an endangered species even if during the last years a slight decrement in the overall population has been noted. They have estimated in about 10.000 specimens the total African population (Thiollay-2000). Much gregarious outside of the period of nesting, it can be met in groups of some units busy in a common hunting. Conversely, it isolates and strongly defends the territory when nidifying. Monotypic species in Africa, has on the contrary three congeneric species living in Asia. It is often considered as a guardian of the savannah, when undaunted and day per day, always on the same shrub, stands waiting for the right moment to seize its preys. It makes long glides to just above the ground carefully monitoring the crossed area and doing those violent deviations that remind the flight of the harriers, and then going back again on one of the shrubs chosen for controlling its territory. This behaviour, typical of the subject who has taken possession of a territory, is not shown out of the nesting period. It lives in grassy savannahs where graze huge herds of cattle that often follows in their movements for then pounce on the insects they move during their passage. They are often seen also during the fires, frequent by the time of the dry season while flying over the fire line in great number, they twirl looking for escaping insects. Of course, as clearly cites its name, it nourishes of big insects, especially of grasshoppers. It does not tolerate densely wooded areas and thick forests even if spaced by small spaces of savannah. At times, it raises in the sky up to 1000 m of altitude performing large pirouettes like if it would wish to breath cool air after having spent long time in the heat of the savannah, and then going back, undaunted, to the same branch from where it had started. 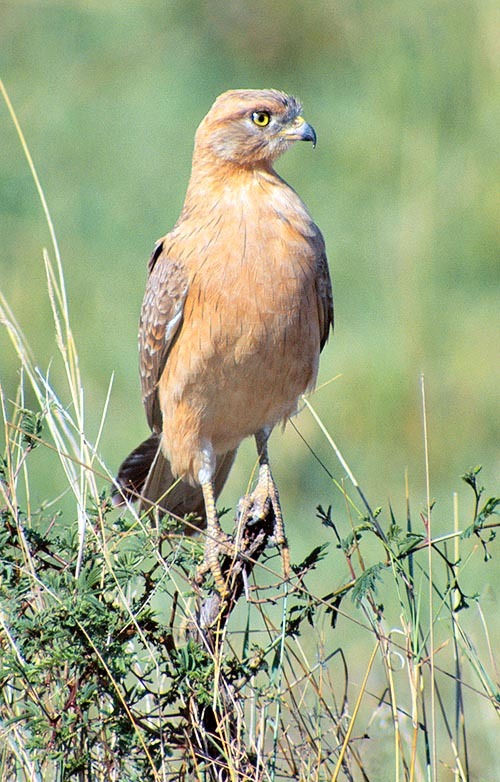 The Butastur are small birds if compared to the usual birds of prey frequenting the savannahs. The grasshopper buzzard has pointed wings, a discreetly pronounced tail and a fairly light and different flight if compared to the common buzzards. The legs are rather short, seen the purpose for which they are foreseen, but are equipped with good claws. For this reason, also the beak is not too robust and is of a vivid yellow colour with blackish tip. In the upper part of the body the livery is brown greyish with darker head and with the alar coverts of reddish brown colour that are amply shown when flying. The lower part is of hazelnut colour, slightly paler than the upper part, spotted of reddish and in neat contrast with the rest of the livery and the underwing, completely whitish. The eyes have a quite evident bright yellow, with very black iris The young have a colour similar to the adults but show a more reddish colouration especially on the head. The total length is of about 40 cm and the wingspan is of 100 cm ; the weight is about 500 g. The female is slightly bigger than the male and does not show any sexual dimorphism in the livery. 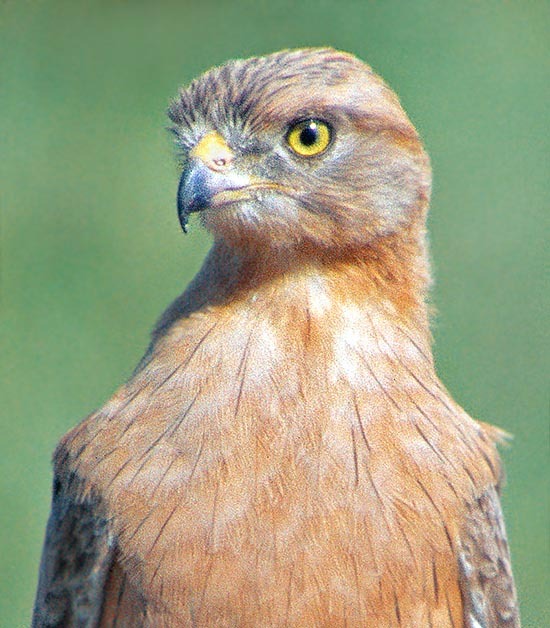 The grasshopper buzzard nests only in the northern part of its range close to the area of the sub-Saharan Sahel. It builds a nest with small withered twigs and covered inside by fresh leaves. The nest is quite small seen its structure, so much to look like that of a passeriform or of a starling. The central cup does not exceed the diametre of 20 cm and when hatching the bird lies there flattening exaggeratedly. The nest is placed a few metres over the ground usually on spiny and inaccessible acacias or, sometimes, on the only big tree available in its territory. It usually lays three whitish eggs spotted with reddish that are hatched for about 30 days. The young keep in the nest for about 6/8 weeks. → To appreciate the biodiversity within the birds of prey and find other species please click here.